Fun with Statistics | Inertia Wins! 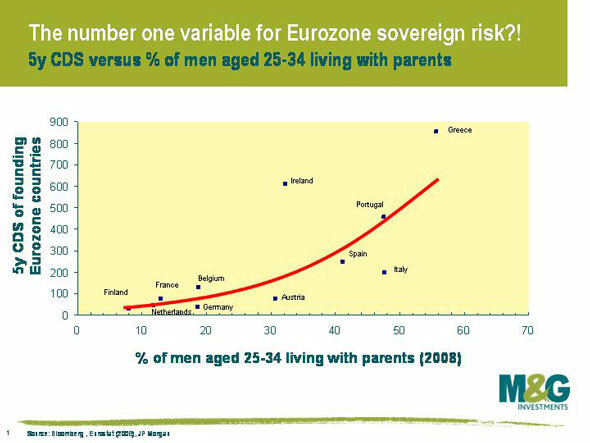 According to this graph, the higher the percentage of a country’s males aged 25-34 live with their parents, the higher that country’s sovereign debt. Remember, though — correlation does not equal causation. For one, this graph lists 11 Eurozone countries. But that’s out of a total of 25 Eurozone countries. Was there a reason the other 14 were left out? Maybe they fit the trend. Maybe they don’t. But since they aren’t there, we don’t know. Even so, surely for some people, living with their parents for so long is caused by a lack of ambition and initiative. Those are two key ingredients for entrepreneurship and growth, which are important debt reducers. And a lack of them could be one cause of higher social spending, which increases debts. The story this graph tells makes intuitive sense. But one wonders how much it matters compared to the many other factors in play.